(January 2018) Among the developments resulting from the demographic change in Western societies, ageing populations represent one of the biggest challenges. The increasing number of older people, including those in need of long-term support, sets high demands on the informal and formal provision of care. In Europe, it is usually the relatives assuming the role of caregivers to an elderly family member and, thereby, dedicating time and effort to an abiding commitment. Thus, caring for a relative in need can become a burdensome experience affecting one’s well-being. However, apart from the intensity and specifics of caregiving, circumstantial factors can further influence a caregiver’s well-being. A new study by Melanie Wagner and Martina Brandt finds that the regional availability of formal long-term care is positively linked to the well-being of spousal caregivers. 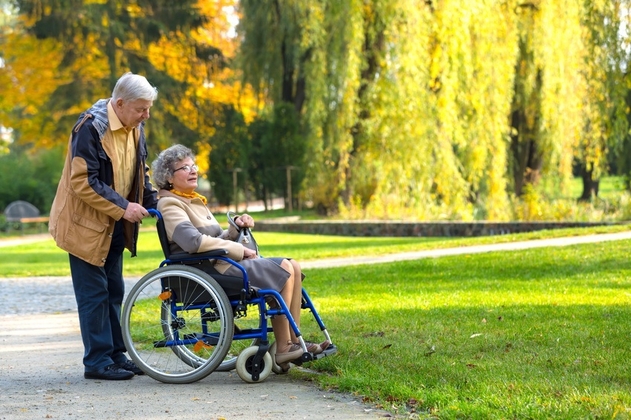 Local provision of formal care improves caregivers’ well-being by enhancing the sense of perceived “control” over managing the care need, conclude the authors. The researchers used data from the fifth wave (2013) of the Survey of Health, Ageing and Retirement in Europe (SHARE). The representative panel compiles input from over 29,000 respondents aged 50 and older in Europe and Israel. Considering that the 1,800 individuals providing support to their partners make up the majority of cohabitating informal caregivers, the study set focus on spousal caregivers. In order to assess the caregivers’ well-being, the researchers measured aspects of life satisfaction, loneliness and depressive symptoms. The concept of perceived “control” was introduced, analysing the link between regional availability of formal care resources (e.g. nursing homes, residential care facilities) and the caregivers’ well-being. In accordance with previous studies, the researchers confirm that spousal caregivers carry a burden of their circumstances in terms of lower life satisfaction as well as higher levels of loneliness and depressive symptoms than noncaregivers. Moreover, the results demonstrate a certain susceptibility of spousal caregivers associated with their socioeconomic and household situation. Compared to noncaregivers, spousal caregivers tend to be older, less educated, less financially stable, having more physical limitations and living in smaller households with more children, often in rural areas with less access to public services. The results further state that spousal caregivers experience less control over their lives. That, however, changes with the availability of formal long-term care services: regional availability of care resources is positively associated with an increased well-being of spousal caregivers. This link is partially attributed to a perception of control over the circumstances. “When people are forced to become caregivers, it will come at the expense of their well-being and possibly also at the expense of the quality of care”, the researchers point out. Hence, the availability of alternatives to informal care leads to a sense of being in control of the care situation and, thereby, results in improving the overall well-being. Ageing populations represent a unique challenge for European governments. In order to counteract the rising costs, trends towards deinstitutionalisation, privatisation and marketisation of formal care can be observed in many countries. Yet, the results of this study suggest that the opposite would be a far more beneficial strategy. Investing in the provision of easily accessible formal care resources is crucial for the well-being of caregivers, receivers and communities. “Based on our findings, local governments can actively influence the conditions for healthy aging of a growing number of informal caregivers and receivers”, conclude the researchers. Study by Melanie Wagner, Martina Brandt (2017): Long-term Care Provision and the Well-Being of Spousal Caregivers: An Analysis of 138 European Regions. Journals of Gerontology: Social Sciences (online first).